The health care provider will most often suspect acoustic trauma if hearing loss occurs after noise exposure. 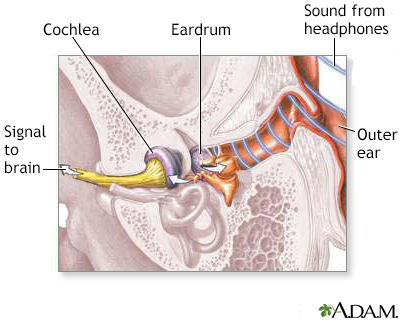 A physical exam will determine if the eardrum is damaged. Audiometry may determine how much hearing has been lost. Hearing loss may be permanent in the affected ear. Wearing ear protection when around sources of loud sounds may prevent the hearing loss from getting worse. Tinnitus (ear ringing) can also occur.